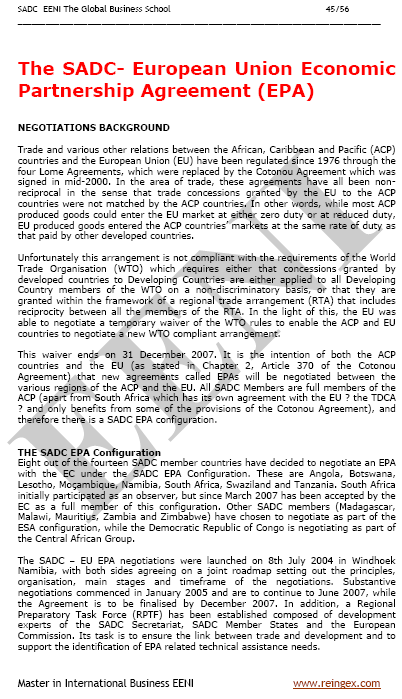 Syllabus of the Online Course (Subject): European Union's Free Trade Agreements (FTAs). Bilateral and regional negotiations in progress. 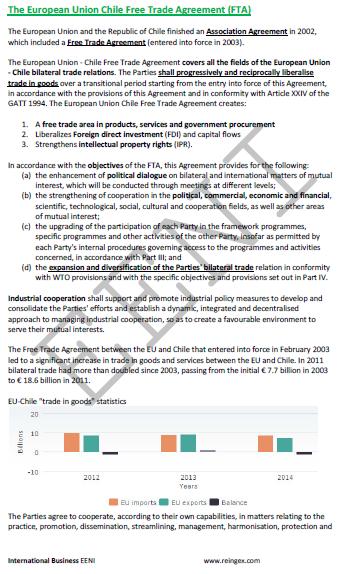 The European Union is the largest global trade player: 20% of global international trade. China is the second-largest trading partners of the European Union after the United States. 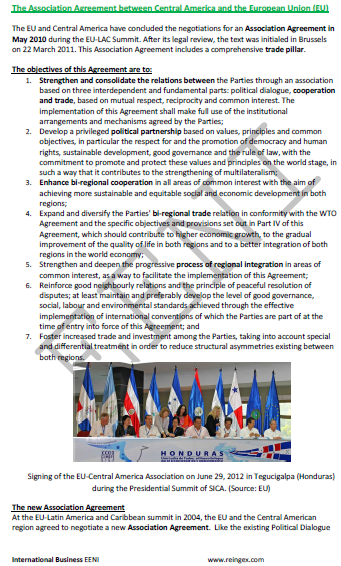 Each Free Trade Agreement negotiated by the European Union is adapted to the situation of each nation. 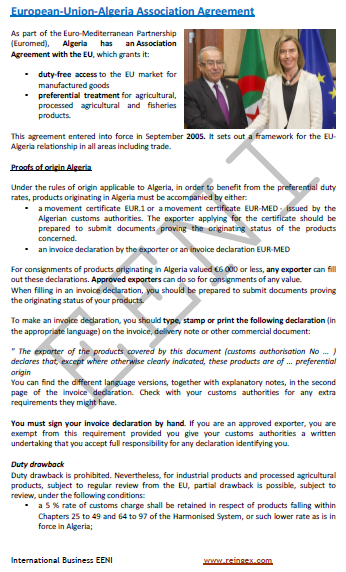 The European Union has granted duty-free access for most of the imports from developing countries (Generalised system of preferences). 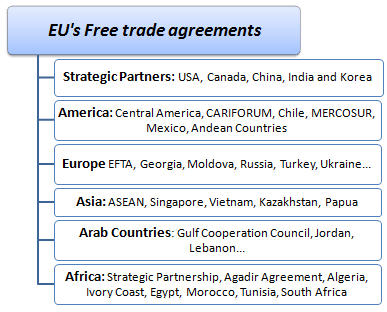 The European Union Free Trade Agreements (FTA): The Arab Republic of Egypt, Jordan, Syria, Tunisia, the Palestinian Authority, European Free Trade Association (EFTA), South Korea, Association of Southeast Asian Nations, the Gulf Cooperation Council, Central America, the countries of the Andean Community, the MERCOSUR, Chile, Mexico, Turkey, India, China, Lebanon, Algeria, the CARIFORUM, Ivory Coast, and Georgia. 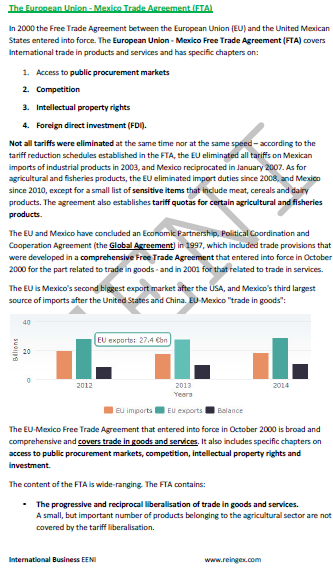 The beneficiary countries of the EU's free trade agreements are Germany, Austria, Belgium, Bulgaria, Croatia, Cyprus, Denmark, France, Slovakia, Slovenia, Spain, Estonia, Finland, Greece, Hungary, Ireland, Italy, Latvia, Lithuania, Luxembourg, Malta, the Netherlands, Poland, Portugal, the United Kingdom (BREXIT), the Czech Republic, Romania and Sweden.